about two different shakuhachi-playing "Fuke komo-sō" lay monks. 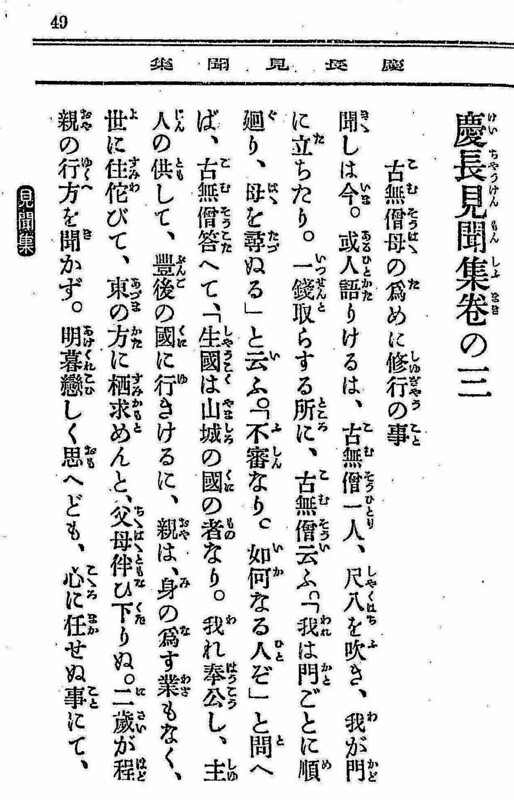 普化宗, in these two texts, at all. 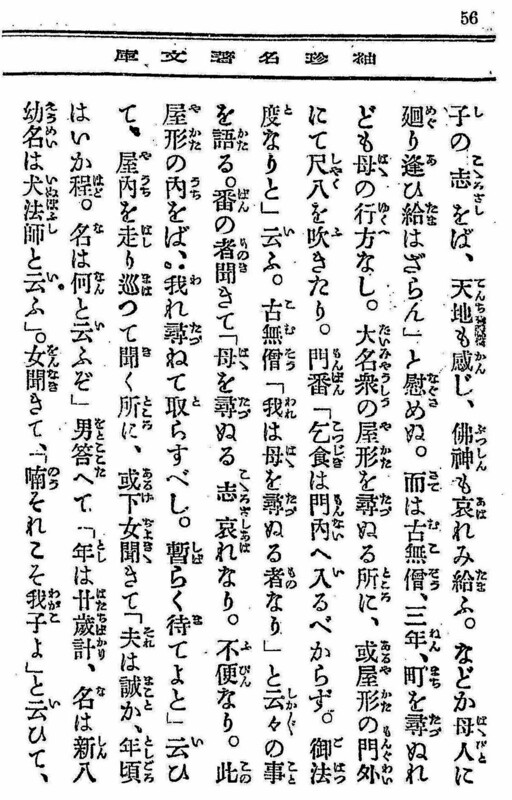 The most well known of these two anecdotes was first presented in Kurihara Kōta's 1918-publication Shakuhachi shikō, on pages 183-184 in the 1975 reissue version of the book. 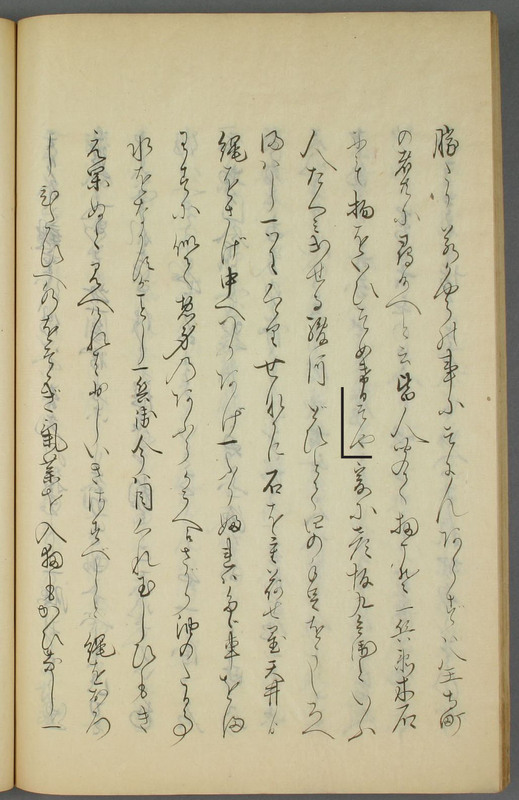 This is a noteworthy example of a however quite common falsification of original text sources in the field of Japanese shakuhachi history research. 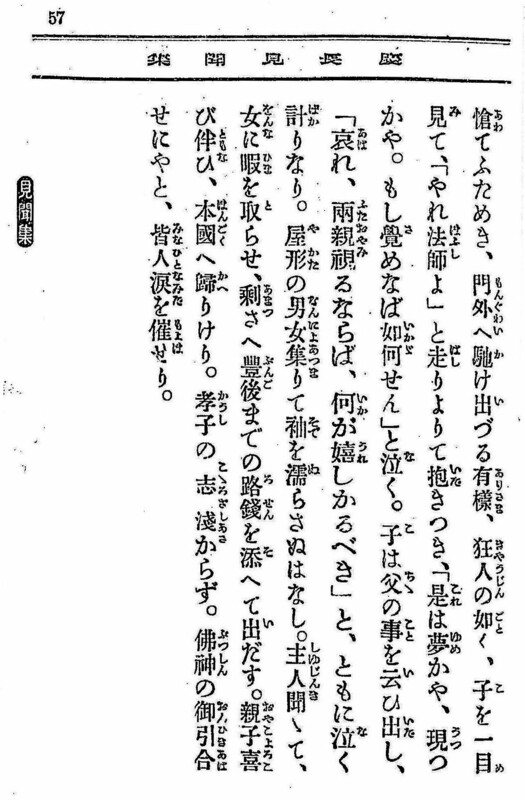 The second anecdote actually opens Volume 3 (Maki 3) the Keichō kenmon-shū as Chapter 1. Anecdote No. 1: Ōtori Ippei and a "Fuke komo-sō" in the town of Hachi-ōji. 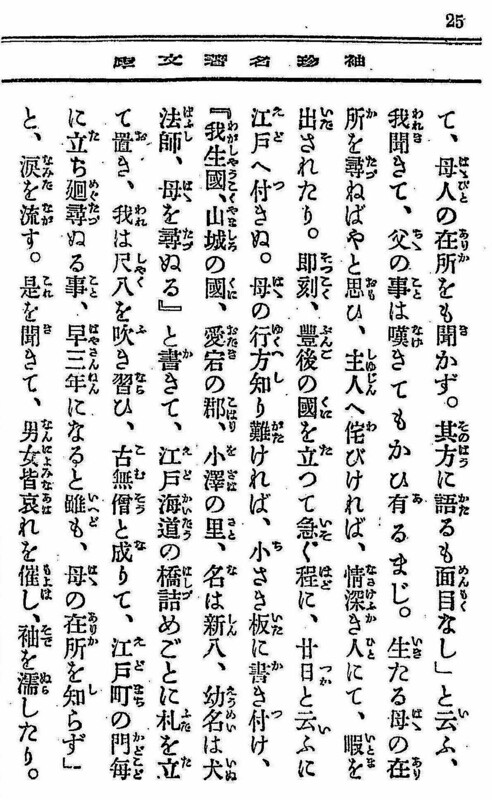 "The Matter of Ōtori Ippei"
This anecdote is contained in chapter 2 of Volume 6 (Maki 6). 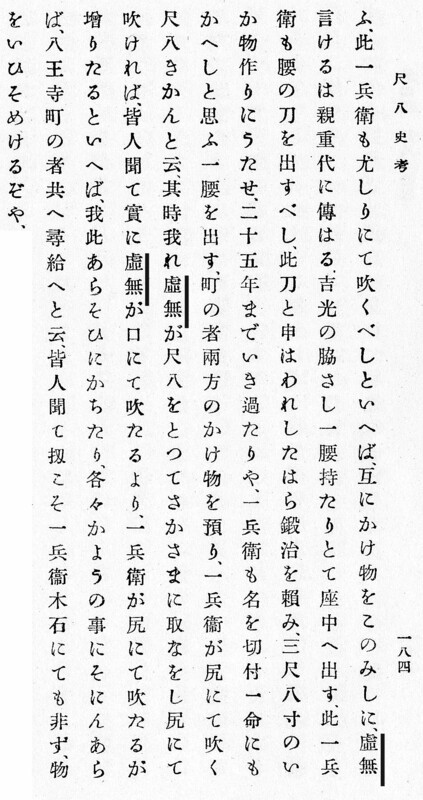 It is essential to observe that the original text features the character compound 古無(僧), and not 虚無(僧), as given everywhere in Kurihara's 1918/1975 version. 古無僧 - KO-MO-SŌ? / KO-MU-SŌ? 古無殿 - KO-MO-DONO? / KO-MU-DONO? 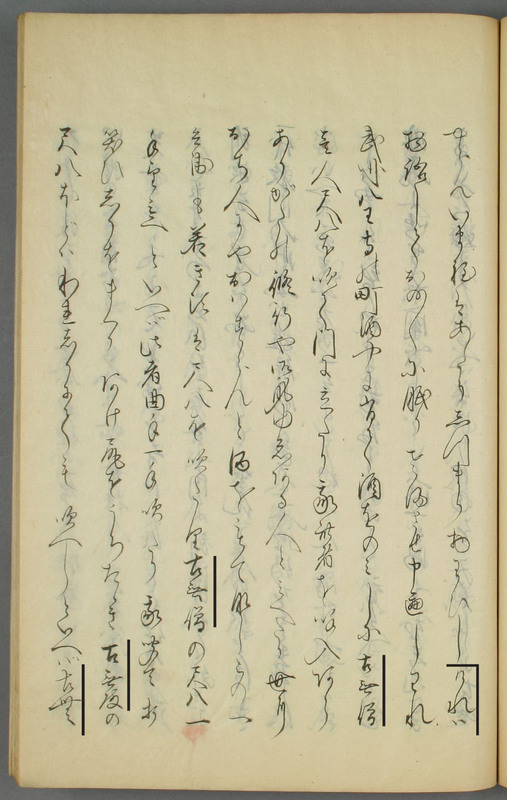 The narrator of the present anecdote being rendered in the Keichō kenmonshū, named Ōtori Ippei, was a figure affiliated with the early kabuki theatre. Born in 1588, Ōtori was executed by the bakufu in 1612, only 24 years old. More information about this background will be added the soonest possible. 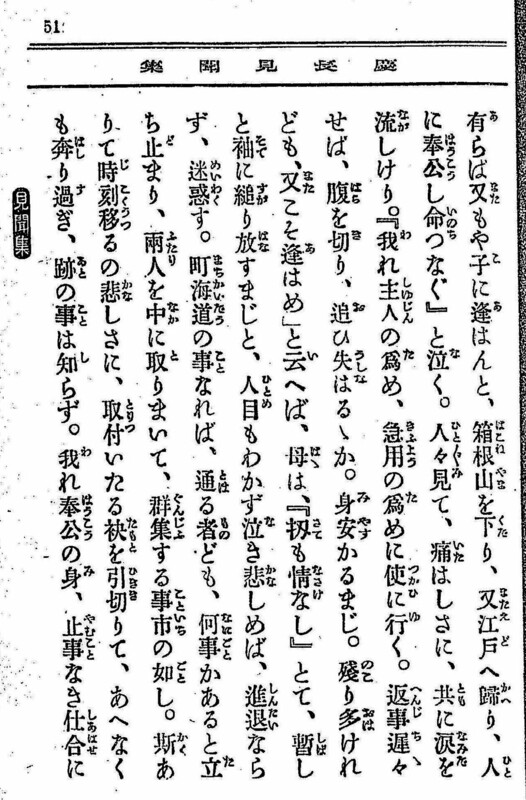 The Fuke Shakuhachi player being quoted in the following text was not a 'KOMU-SŌ'! 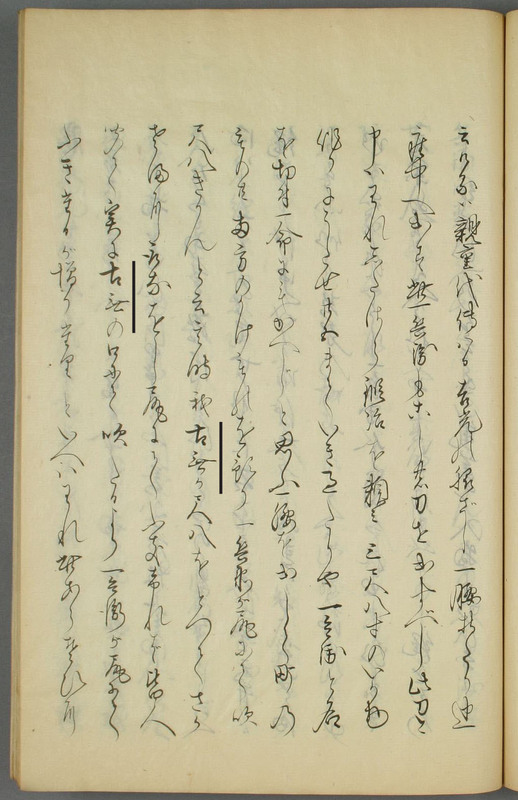 The shakuhachi-playing lay monk in this anecdote, of samurai heritage, is described phonetically by Miura Jōshin as a ko-mu-sō, 古無僧, "old+noone-ness+monk", the reason simply being that the author did not know how to write the term komo-sō correctly. The confusion of the phonems mo and mu is certainly not uncommon at all, as those two syllables are virtually homonymous. At this very time in history a mendicant shakuhachi "lay monk" would rightly still be known as a Fuke komo-sō, not a komu-sō. 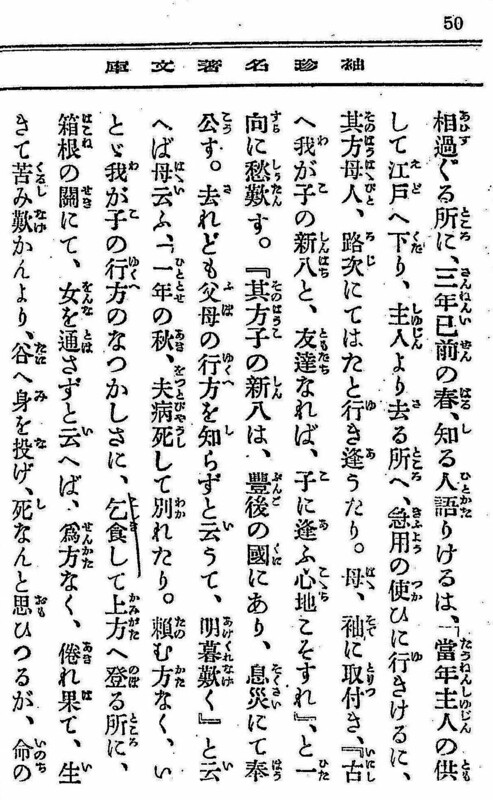 There were definitely no komu-sō, 虚無僧, in existence and action in Japan before sometime after the Shimabara Rebellion on Kyūshū in Southern Japan in 1637-38, at the earliest. 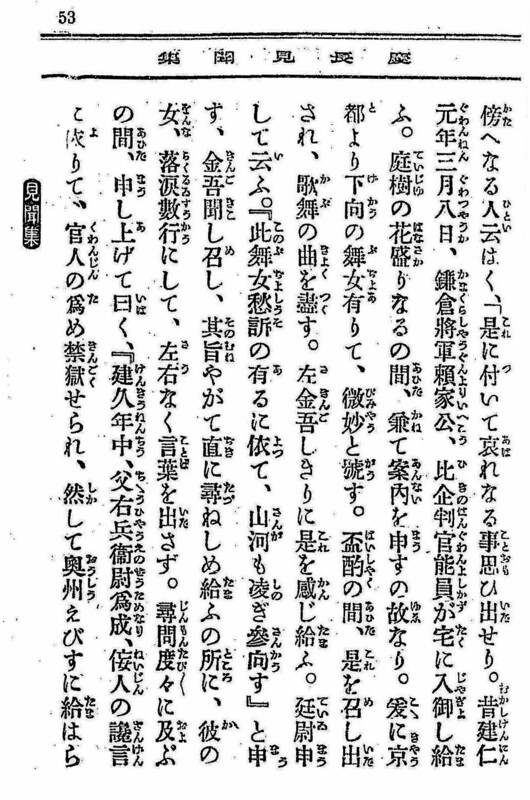 First, here follows a presentation of the central part of this very significant text, in which the Fuke komo-sō proclaims the shakuhachi "credo" of his. But when I recall my former occupation, I do not grieve over poverty and lowliness but hold on to the fate of the Way of the Buddha and reserve all my considerations for the Doctrine. I have no inward possessions, no outward desires, and I calmly follow in the footprints of Priest Fuke and have entered upon the way of True Detachment and Spiritual Deliverance. But even though I strive hard in ascetic discipline, I find it difficult indeed to maintain a peaceful mind when I am confronted with an atrocious word. - - - "
The below English translation (here with but a few slightly refining adjustments) first appeared in my 1987 Copenhagen University Japanology thesis on the Kaidō honsoku document, dated 1628 - published internationally in 2003 by Tai Hei Shakuhachi, California, USA. 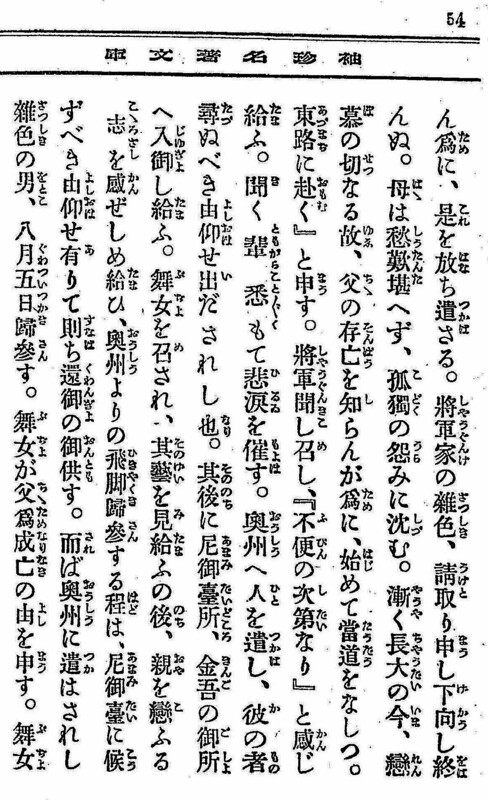 Do note that the story is being reported by Ōtori Ippei, here retold by Miura Jōshin. In the town Hachiōji in the Musashi Province, while I was drinking sake in a wine shop, a kom*-sō, 古無僧, came up to the gate while blowing a shakuhachi. Dear me, I called out to him! You are an auspicious practitioner of asceticism, I suppose. You seem to be a devoted person, I said. If it is your intention to be scattered in the world, sparing a home for ordinary humans, please let me entertain you with some wine. I myself played the shakuhachi when I was young. When I said, I would like the kom* master, 古無殿, to play a melody on his shakuhachi, he played a tune. What an inconsiderate and most uncomplimentary remark! now I have become one who has abandoned the world. but hold on to the Fate of the Way of the Buddha and reserve all my considerations for the purpose of the Doctrine. and have entered upon the Way of True Disattachment and Spiritual Deliverance. I find it difficult indeed when I am confronted with an atrocious word. Even if that might be changed, could I possibly alter my way of thinking? At any cost, I shall have to hear you play with your rump," he said. 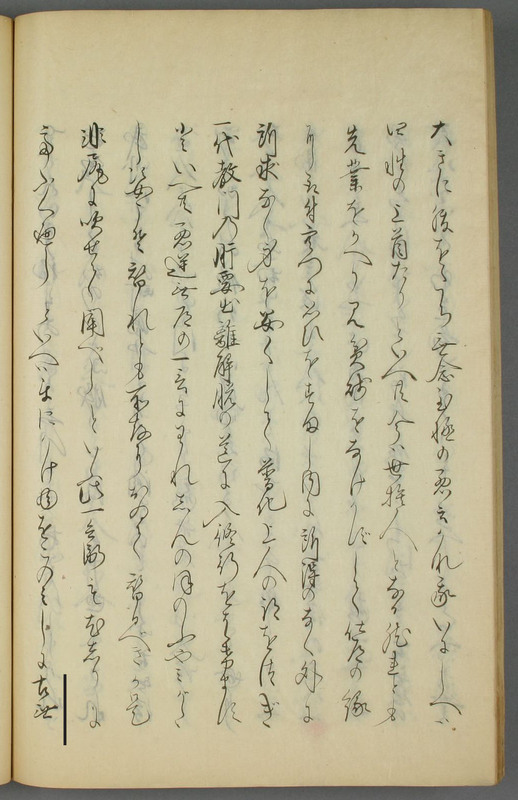 while the words that the kom*-sō, 古無僧, had spoken were written down for successive generations. The kom*-sō, 古無僧, drew out in the open the sword he was carrying by his side, proclaiming that it was a genuine Yoshimitu. I myself was obliged to draw my sword, too. forged as an imitation 3 feet 8 inches long and probably no more than 25 years old. I also shouted out the name of my sword and drew it as if ready to pay back with my life. A townsman took charge of the stakes, and I exclaimed: Well, now, would you like to hear me play the shakuhachi with my arse? Believe me, it is better that I played with my arse than that the kom*(-sō), 古無(僧), played with his mouth! And than I was the winner of the dispute. 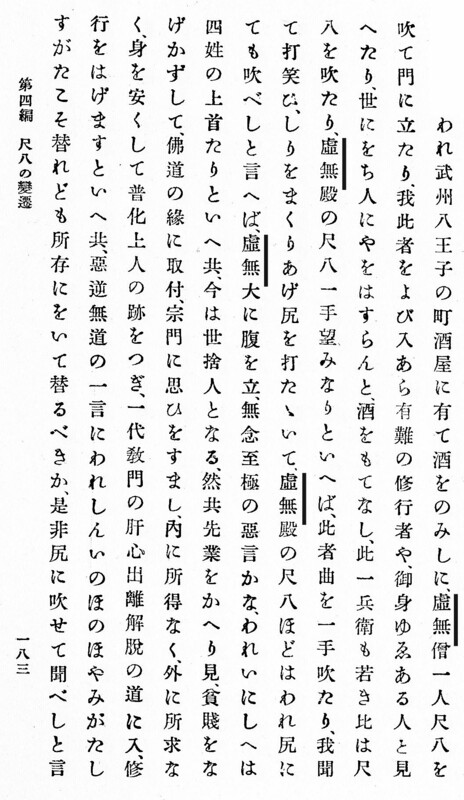 If there is anyone who does not believe any of this, just ask the people in Hachi-ōji, I said. Ippei was certainly not made of wood nor stone. He told the most colourful stories [Miura concludes]. Anecdote No. 2: A kom*-sō" practices asceticism "for the benefit of mothers". 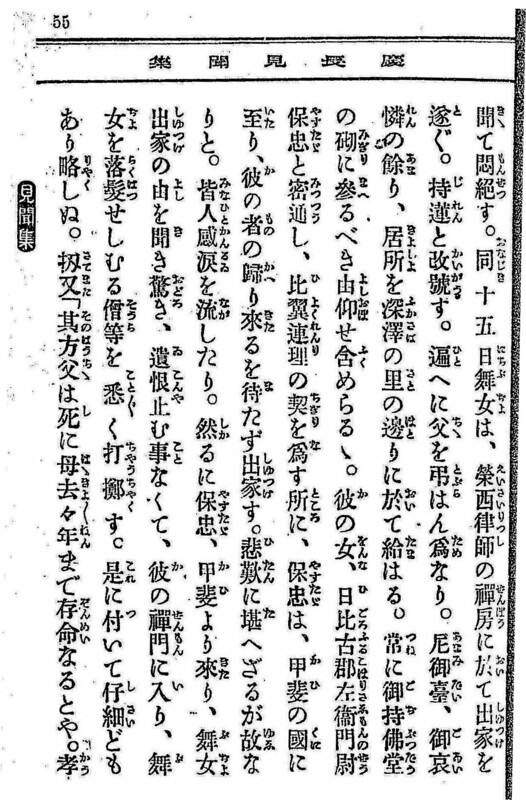 "The Matter of a Kom*sō Practicing Asceticism for the Benefit of Mothers"
This anecdote is contained in chapter 1 of Volume 3 (Maki 3). A further introduction to the subject matter of this text will be presented soon.